The historic Beijing 2008 Olympic Games are starting today. Now you can view and update yourself on Olympic Sailing Competition 2008 from the new ISAF Olympic Games microsite. The first Sailing competition was contested at the 1900 Olympic Games, the next was in 1908 and thereafter it has been part of every Olympic programme since that year. The new ISAF Olympic Games 2008 microsite is here. You can view updates on 11 events participated by 400 sailors from August 08 -24 being held at Qingdao. Here is the full list of sailors at the Beijing Games. Here are the Nations qualified for 2008 Olympic Sailing Competition. Here is the History of Sailing at Olympic Games. Here is the glossary of sailing terms. Here is a numerical look at the sailing competition of the Beijing 2008 Olympic Games based on historic facts and figures. Also you can view a wide selection of Beijing 2008 Olympic Games clips at the Official IOC Content on YouTube. Beijing 2008 Olympic Games Competition Schedule is here. Here is how Google celebrates Beijing 2008 Olympic Games. The next London Olympic Sailing Competition will be in 2012 at the Weymouth and Portland National Sailing Academy (WPNSA). A total of 380 athletes will compete across ten events. Here is the photo gallery of Opening Ceremonies of the Beijing Olympic Games 2008 from Time. The 2008 Beijing Olympic Games Sailing Competition concluded on August 24 has brought together 400 of the world’s finest sailors racing in 272 boats representing 62 nations. The competition witnessed 117 races during 13 days of competition in 11 sailing events to decide winners of the 33 sailing medals. Read more from ISAF Olympic Games microsite. 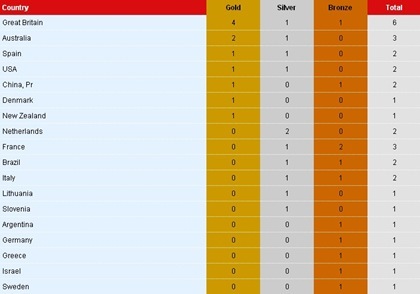 Here is the final Medals Tally. The ISAF Official Film of the 2008 Olympic Sailing Competition DVD is available for delivery worldwide in either Pal and NTSC format . The DVD is priced at £25.00 and can be ordered direct from the ISAF Secretariat. For more details on DVD, log on to ISAF.